Is mobile communication rather a trouble that convenience for you? Are you obliged to search for a better spot in your house to make o receive a phone call? Feel anxious? Then why not to solve the problem right now? Here we present you a new mobile booster that is designed to improve mobile signal and enlarge mobile coverage. This equipment is highly effective for remote areas where cellular base towers are located far or when the signal comes to your house weakened due to landscape obstacles and peculiarities. LCD-130 mobile booster is a GSM repeater for increasing cellular coverage in location of small dimensions. The device is able to create stable and uninterruptable mobile connection in your private house, office, garage, studio or any other small places up to 130 square meters. The Nikrans LCD-130 is an improved version of the most popular mobile booster from Nikrans. It features high capacity and efficiency and has a night LED indicator for your convenience. 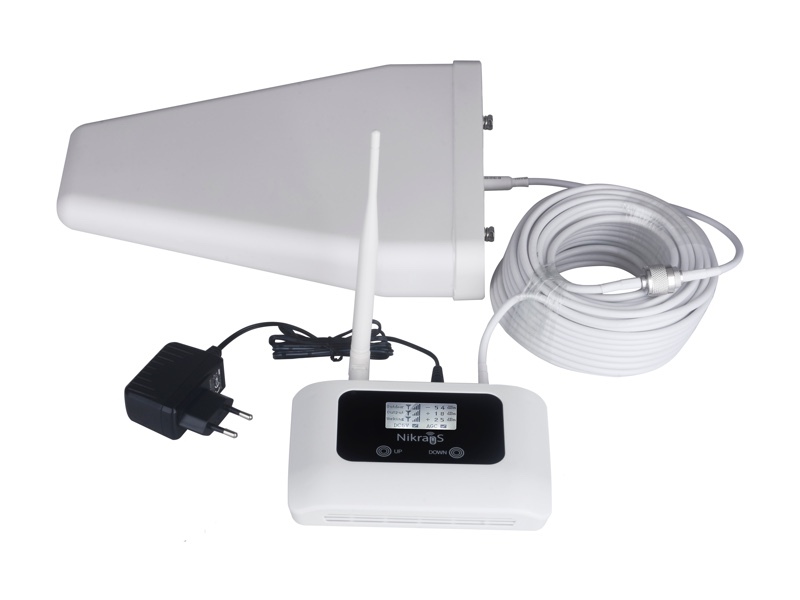 The GSM amplifier kit consists of the outdoor Yagi antenna that is supposed to be directed towards the cellular tower, the indoor omnidirectional antenna that distributes the signal among all mobile devices within the coverage area, the mobile repeater itself and all the accessories for mounting the equipment. The installation of the device is as easy as a pie. Even a non-technical person is capable of setting the device up only having read the manual. However, even some troubles or questions appear, you can always Contact client service support and receive assistance and advice from professional team. One of the major features of the mobile repeater consists in its safety for your health. It is common knowledge that cellular towers as well as cell phones emit radiation, so the peculiarity of the GSM repeater is its ability to reduce the level of the emitted radiation. So with the help of LCD-130 you can not only improve mobile communication, forget about missed and dropped calls, but also protect your health from harmful influence of modern technique. The Nikrans LCD-130 is supposed to boost only the quality of communication. However, there are also mobile booster models that are able to improve also 3G Internet and even wireless WiFi connection. 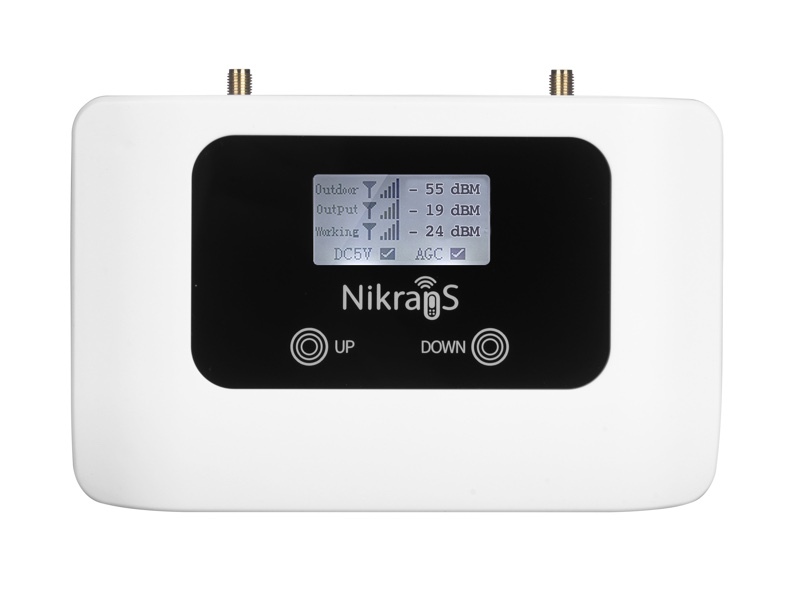 So as to boost 3G mobile Internet, choose one of the 3G signal booster kits from Nikrans and get uninterruptable connection to all 3G applications in mobile environment. The mobile repeater is a magic wand for thousands of people who suffer from poor mobile coverage and cannot enjoy mobile communication at its full extent. Don’t suffer, solve the problem with the help of a cell phone booster from Nikrans. One of the main conditions to choose a mobile phone signal booster in order to efficiently boost your signals at home or in the office is to determine, firstly, how strong the outside signal is, and, secondly, to find out the exact type of GSM, 3G or 4G signal you need to boost. What is a 4G signal booster and what it is meant for? The answers are here.